The success of a business depends on many factors, some of which are objective and completely out of our control like for instance, the shifts in the local economy. This grim fact forces us to pay much more attention to the assets that are actually under our control. The ability to deliver a strong and charismatic business presentation is definitely one of these assets. Whether you are trying to persuade the investors, push a new product, or present some risky plan to your senior staff, the ability to successfully sell your ideas may be the only thing keeping your business away from disaster. Let’s take a look then at some of the methods you can use to make your business presentations, stronger, enticing, and more memorable. In order to be successful, any presentation has to have a structure and a clear goal. Otherwise, the points you are making will quickly get lost in an empty chatter. So, start with the punch line and then work backward to discover the steps you are going to use to build the momentum and finally drive the point home. • What do I want people to get out of my presentation? • How can I gain their trust? • How can I build the foundation for the next steps I want to take? Do your best to find out as much as you can about the audience’s attitudes and roles in the organization, so you can gather the supporting data and provide appropriate visuals. This is an absolute must. If you ever want to sound convincing, you have to demonstrate expertise in the topic you are going to present. Besides, being a better-informed party will always help you get the upper hand in the conversation and deliver your arguments with more confidence. Therefore, do your best to gather all the relevant info backed up by numbers and statistics and learn them by heart; that way, you’ll be able to deliver the answers to surprise questions without too much delay. No matter how hard we try to keep the world of business grounded in cold numbers, human beings are governed by emotions. This fact can be easily exploited during presentations. Do your best then to use your presentation to tell a story and provide deeper meaning to your message. The abstract statistics are much better received when they are introduced with short stories that feature real-life characters personally affected by the numbers you are presenting. These anecdotes will make your presentation much more tangible and relatable. In most of the cases, the people you are going to speak in front of won’t be particularly interested in you or your company. They’ll want to hear how the things you are going to say can benefit their cause – pure and simple. All the techniques, props, anecdotes, stats, graphs and pie charts are only the tools you are going to use to sell fresh ideas present applicable solutions to the problems the audience members might be facing. Presentations that lack these two important ingredients are destined to fail. People generally like wit and improvisation. However, when you need to deliver important facts you have to be confident and punctual. This kind of efficiency can only be achieved through countless rehearsals. Simple memorization of the text can’t help you find the right voice, coordinate the speech with the visuals or make sure that you don’t run out of time. If you want to truly get the most out of these presentations, make sure to perform in front of the live audience. An audience doesn't want to read wordy presentations. As a matter of fact, a recent survey shows that people find them plain annoying. The story you are telling should be delivered by you, and the excessive info like researches and surveys should be distributed to the audience as backup documents. The presentation should contain only the facts that absolutely need to be pointed out accompanied by the strong visuals that will help you to tell a more convincing story. Going slide-by-slide through your presentation can help you to retain the focus of the presentation, but by relying too heavily on a singular presentation method, you are running the danger of boring the audience into submission. Make sure then to occasionally change the pace of the conversation by popping up a whiteboard marker and drawing further explanations, or using your smartphone to play some recording you personally made. These distractions make presentation far more vivid and memorable. Digesting long presentations is much easier when the information is split into smaller, more manageable chunks. These short, thematic breaks are an excellent opportunity to introduce some new powerful image or famous quote that illustrates what you’re going to talk about and sets the tone for the next chapter. Also, each new chapter should be accompanied by a slight change in the backdrop or the type of fonts you are going to use. The audience members need to feel they are making progress. Essentially, you have to make sure to open up the presentation with some bold statement or piece of info that will easily demonstrate your expertise in the field you are talking about. Then, explain the audience how the facts you've presented relate to the goal of the presentation. This kind of opener can help the audience members easily relate to what you have to say from the get-go and establish yourself as a credible voice able to deliver relevant information. The number of introverts and extroverts in each audience is roughly split by half. That is why you should tailor your presentation to the tastes of both these sensibilities. A frontal assault will quickly bore the outgoing audience-members. Enforcing two-way communication upon the participants who simply want to hear your points is the easiest ways to antagonize them. Try to find the right balance between the two while encouraging willing participation from as much as the audience members as possible. Ideally, your presentation should conclude with the short Q&A sections. Sometimes, though, the audience members feel they’ve learned enough and don’t feel any need to ask additional questions. That is why you should always come with a prepared set of questions that can open new topics that could are easier to explore through live Q&A. These backup topics are usually introduced with the lines like “You might be wondering now…” or “People often ask me…” Even if you get the questions from the audience, you can still use this fail-safe to make sure the right points are made. A good presentation should always end with a call to action. So, once you reach your presentation goal, and lead the audience through the Q&A, you should throw in a second (short) closing where you will summarize your key points (in this case, displaying textual explanations is not only allowed but highly desirable) and call the audience to take concrete actions. The words you are going to use should be simple (download, subscribe, buy, find out, etc.) and enthusiastic (use exclamation marks). Using FOMO (fear of missing out) may feel somewhat cheap, but it’s, by no means, out of the question. We hope these few tips will help you to make your presentations more memorable and engaging. The business world may operate by its own rules, but it's still run by the common people. Knowing how to appear charismatic and efficiently present your case to those decision- makers can prove to be a very important asset in securing your company’s future. I hope you enjoyed this blog post about how to help your company deliver a strong business presentation or sales pitch. 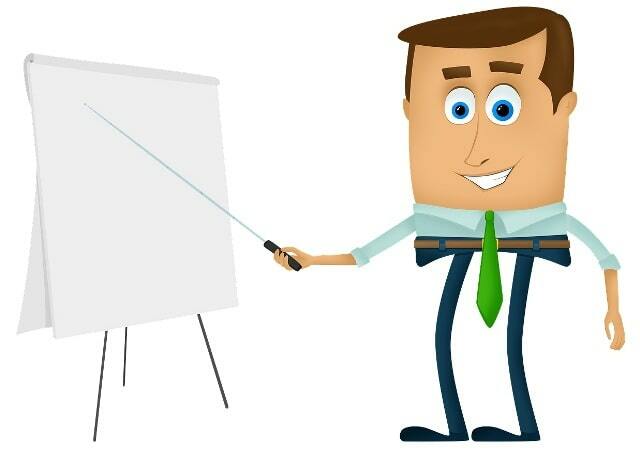 Interested in more articles about improving business presentations?